How to calculate the equivalent resistance value for resistors in parallel? To quickly calculate the equivalent resistance value of two resistors in parallel, you can use the parallel resistor calculator. 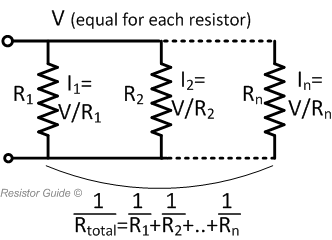 The above equation shows that if R1 is equal to R2 Req is half of the value of one of the two resistors. For a Req of 9 ohms, R1 and R2 should therefore have a value of 2×9=18 ohms. This happens to be a standard value from the E-series. As a solution finally, the designer connects two resistors of 18 ohms in parallel as shown in the figure right. How to solve a network with resistors in parallel and series? 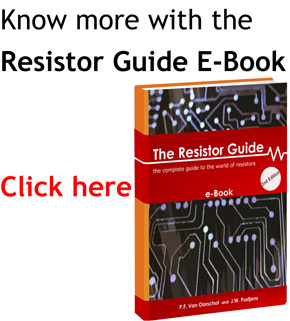 A more complex resistor network can be solved by systematic grouping of resistors. In the picture below three resistors are connected. Resistors R2 and R3 are connected in series. They are in parallel with resistor R1. To solve the network, the resistors are separated in two groups. Group 1 consists of only R1. Group 2 consists of R2 and R3. With the rules for resistors in series and in parallel, also larger networks can be solved. For more complex networks, sometimes Kirchhoff’s laws can be used.